Before the start of every week, I like to plan out all the tasks that I would like to get done. I have a separate perspective for all the weekly tasks. Within these tasks, I include an estimate time of completion for each task. I would like to use this time as a way to calculate estimated completion for the weekly work. Suppose I have several tasks that collectively add up to 1000 minutes of work. If I complete 100 minutes of work, I would be done 10%… I want to be able to see this percentage somewhere. Having this is extremely important to my productivity because it holds me accountable to hitting my weekly targets. Without it, I lose motivation to get work done. Is there any other way I can accomplish this??? 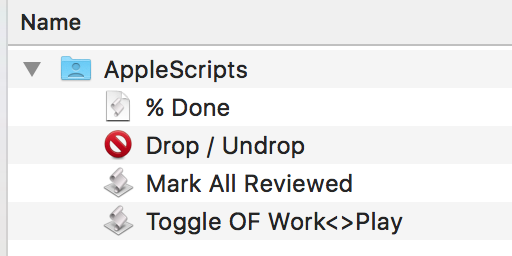 I have an AppleScript that will calculate the % completion status on a set of selected tasks. Suppose you select a project with four tasks and where you have completed 1 of them. You would get a return of 25% complete for that project. I cannot imagine how to modify this script to handle the time parameter that you suggest you need. Are you really needing time tracking, or will a completion status based on number of tasks done in a set be sufficient? Unfortunately, this would not be sufficient since some tasks I write might take 5 min while other would take 2 hours. So doing this based on a task basis would not produce a meaningful % of completion number. I really want to do it based on time as this would be a true representation of % of completion. Is this even possible? AFAIK, time tracking and management is not possible in OF. I think the standard recommendation is to use other apps. Could you please share your script. I’d like to use it. Thanks. I have posted the script and some of my others at this link. I’m a new user (about 6 months) and I also give a great value to this thing of indicating the percentage of a task/project done. I’m a teacher. I have to review 100 works next week, while I have a lot of other tasks do go through as well. So, how do I fit this task in my OF? 1st choice: As one task, for example “Review students work”. But then, I will not be doing that as a WHOLE (I will not be able to review then all in one time), so, should I put a date to be finished by the end of the week, say, Friday? Then it is just like a kind of “ON/OFF” feature (is it done or not?). On Wednesday I don’t have clue on how much I progressed in my task, so my plan for the week can crash by Thursday afternoon. Wouldn’t be great if I have a kind of PERCENTAGE in the inspector to add to each bunch of, say, 20 works reviewed? This way, the task will be completed at the end of the week BUT on Wednesday I will know that I am late and I will have to review more if I want to complete the task as planed and my week is safe! Any way, you can think of many similar situations like these. And, if I may point out a solution, if in the inspector there were a new field with a dropbox asking user to choose the intervals in which they divide the task (is it 3 times or 10 times, or 100 times, which gives a percentage). Then, below that dropbox would appear a number of buttons (or a text box, or a slide) to be pressed as the task goes along. That way we could effectively control the pace and rest assure that we would focus on the JUST DO IT things. That saves the week! Well, I’m sorry to be so long, it’s just a thought and it is really a thing that I would like to see someday implemented, as it would help me so much (Opus Domini app has this feature). What do you think about this? Would it be useful for some of you? I would be hard pressed to use a % indicator in OF. 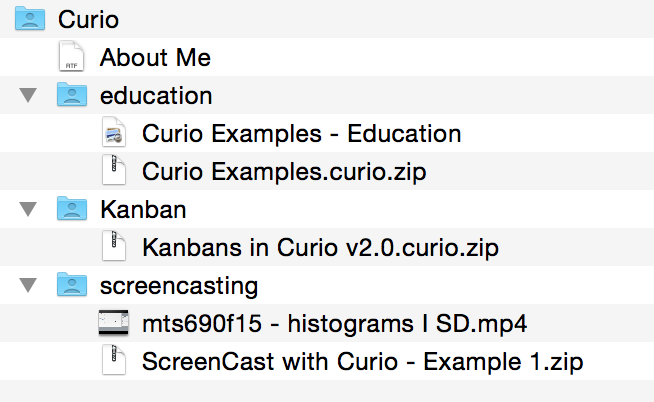 I use a different app (Curio) and a Kanban board approach to manage at the project level. I can track the percent completion using the tools in Curio. When you really must use OF, perhaps you can consider using the time required field. Set the time needed. Decrement it as you complete a project. Otherwise, I presume when you say “… review 100 works …” you mean 100 student submissions that are all from the same class and therefore all due at once. My best recommendation after years of doing the equivalent is to divide the review into steps, something akin to the list below. I understand your point of view and I will think about it. Thank you for your answer.